with a single testprobe, theseautomated machines are reliable, easy to use and accurate.Our milkanalyzers provide test results for Fat, Protein, Solids Not Fat(SNF),Lactose, Solids, Density, Freezing point, Added Water, pH,Temperature.<br /> All milkotesters have RS 232 interface for connectionto PC and external printer. They also have a system for selfcalibration without computer. 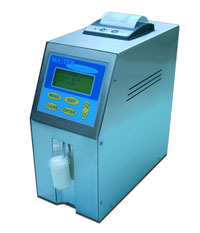 The ultrasonic milk analyzers do not require the use of chemicals or reagents for testing milk.